THANK YOU FOR YOUR SERVICE! 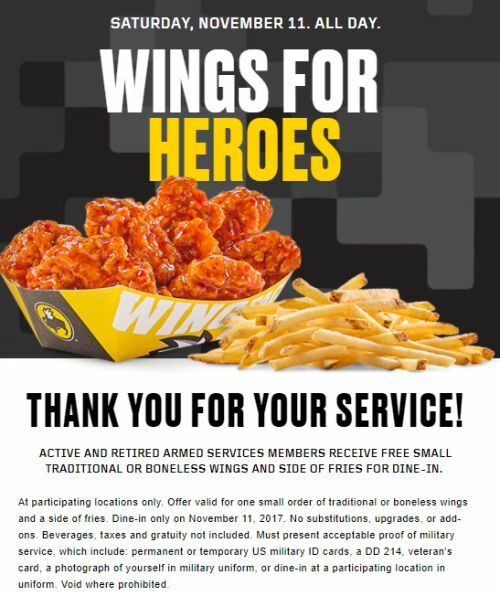 ACTIVE AND RETIRED ARMED SERVICES MEMBERS RECEIVE FREE SMALL TRADITIONAL OR BONELESS WINGS AND SIDE OF FRIES FOR DINE-IN. 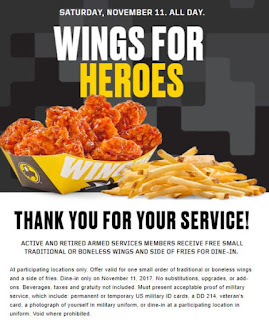 At participating Buffalo Wild Wings locations only. Offer valid for one small order of traditional or boneless wings and a side of fries. Dine-in only on November 11, 2017. Click the link below to get the details.